Japanese cuisine is one of the favorite food of people and that includes me, even I didn't get the chance to go to Japan YET? !, I've heard so many stories from my dad, friends, blog posts and individuals who've been to Japan and they have one thing in common. They love to eat good food at the train stations or subways, in which TENYA is located and serving best tempura and tendon for years. 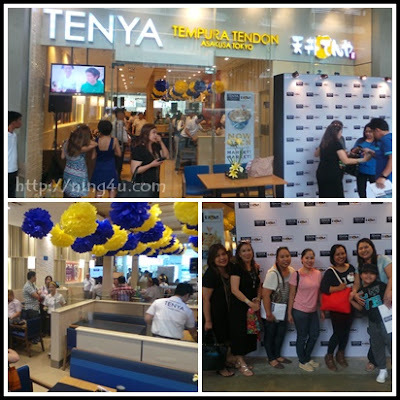 From Japan they grow over 150 branches worldwide, mostly in Asia-wide and they arrived here in the Philippines, Filipinos are enjoying the tempura and tendon meal in SM Megamall and BGC Stopever Pavillion and now they recently open in Market! Market!, in which media and bloggers are invited to try the dishes. One of the Tenya favorites is the All-Star Tendon 325Php that is deep fried with healthy canola oil coated in a puffed up, crisp, golden brown and delicious batter, pinched between chopsticks. It has that perfect balance of flavor and texture in every piece of black tiger prawn, squid, salmon, kani stick, green beans and mushroom. Serve with steaming bowl of Japanese rice and of course it comes with the distinct Don Tare sauce(a blend of secret sauces) only Tenya can offer. We also enjoy other Japanese cuisine, served in perfection by Tenya like the Isobe Cheese, Karaage and my favorite the Spicy Salmon Salad. Fresh and generously serve with Japanese plating style. For more satisfying treat by Tenya, follow them on their social media accounts on Facebook/TenyaPhilippines, Twitter and Instagram @TenyaPH.